I was talking to some friends the other day about my sustainable living eBooks and after I told them what they were about, naturally the conversation steered towards sales figures. I think they were curious to see if there was any money in it. Now, I didn’t really know the exact figure, and even though there is a small but steady monthly royalty from the eBooks that comes my way, I have never been in it for the money. Therefore I couldn’t answer their question. Additionally, they were very surprised that I give away my first book for free! I told them it was my gift to my readers, which they really couldn’t understand. Anyway, it got me thinking. How many copies of my first eBook The Greening of Gavin – My First Year of Living Sustainably had I sold or given away for free (mainly free)? It must only be a hundred or so. So, I took the time to do the maths and was very surprised that since it was first published in June 2012, nine hundred and seven (907) people have downloaded, and hopefully read it! I was gobsmacked. That is so many people! I am so grateful to all of you who have taken the time to read about my initial motivation to live this chosen lifestyle, and to learn some tips about sustainable living. Not being one to rest on my laurels, I have decided that for every single person who signs up to receive my blog posts via email, that I would throw in a FREE copy of the eBook as a bonus. The more the merrier I reckon. So if you are interested in signing up to receive the blog via email (only 3 a week) and want to get the eBook for FREE as well, then please sign up here. You’ll receive an email with a link to the book within an hour of signing up to the list. Alternatively, you can use the embedded signup form on the right hand sidebar. Also, if you have already subscribed, I will be sending a link later on today to all who are already on my list as a bit of a gift and a thank you. There maybe even a little bonus surprise as well! Whilst we are on the eBook topic, my gardening eBook manuscript is slowly plodding along which is tentatively titled Suburban Food Farm. It is taking much longer than expected due to so many workshops and actual gardening tasks that it only gets worked on once a week. Sorry about the delay if you are waiting for this one. I have also been thinking of continuing my future vision stories (like yesterdays post) as a full blown novella (around 20,000 words). What do you think? Does it have potential? If this project did go ahead, I would definitely require an editor as it is my first work of fiction. Anyway, I would love some feedback as I just love writing, which you can probably tell by the frequency of my blog posts! What Will the Future of Shopping Look Like? Short Story. The other day within my post about My Consumerism Meltdown (But I Got Better), I whinged and moaned about the new shopping facility that has been added on to our existing shopping centre. The entire place has been revamped for a “2013 look and feel”. All well and good, everyone is entitled to a rant now and then, but did I once offer up a viable solution besides farmers and craft markets? No, and I should have. Upon reading it again, it sound like one big torrent of words, with no purpose except to vent my emotional state at the time. So what would a sustainable, ethical and green shopping centre look like? Funnily enough, my friend Jabir and I talked about this very concept a few days later. We had a good laugh as we went along talking about green roofs and solar power, but I want to take it one step further. I want to take you to around the time of my 65th birthday, sixteen years into the future, just like I did when I wrote the short story Transition Dreams. Lets continue the story, shall we? Kim was concerned that I had to peddle over 15 km to get to the shops. She was after a replacement hand mixer and grinder that I just couldn’t fix. Besides, I wanted to get my radio fixed so as to listen to the local radio station that still managed to stay on air. Sometimes I think they must broadcast using AA cells and used chewing gum, but hey, who is complaining. It’s nice to hear music and a bit of local news occasionally. We can spare the juice. Our nearest fix-it man is located at our recently reconstructed main street, which replaced all the shops at the old vacant shopping mall. The flash looking mall that was refurbished in 2013 soon fell into disrepair after the second Global Financial Crisis. No one could afford the rent, let alone that stuff that they used to stock. People didn’t want stuff that broke within six months. They now wanted stuff that lasts. Ben piped up from the garden. “I’ll go with you old man. I need a break from the food farm. Besides, it is not as safe out there as it used to be”. Ben was right. A roaming band of no-hopers had been seen in the area causing trouble on the roads. Nothing too serious, just an inconvenience that the local law hadn’t caught up with yet. “Sure mate. Happy to have you along”. I loved Ben’s questions. Our road trips were always good for a chat. Ben was approaching his 30th birthday in a few months, and he had learnt so much in the last few years. He and Kylie must be thinking about having kids soon, now that the area is relatively safe, and that we had a strong local community. “Well Son ….” I reflected as we rode along, towing the bike trailer behind us. “People got sold a lie”. “Well, in the end everything was a lie”, I said. “That doesn’t answer my question old man”. “Why didn’t they realise where we were heading?” asked Ben. “It wasn’t in their self-interest to wake up from the Matrix. Why change when they were living in the most affluent and energy abundant period in human history.” I said. It took about forty five minutes to ride to the shops, but it didn’t seem that long. Probably because the ride was blurred by the interesting conversation along the way. There was no trouble to be seen. The old mall had long been stripped of usable materials. There was no use keeping the interior shops functioning because it was just a concrete box. No natural light to speak of and no airflow. In summer it was hot as hell and freezing in winter. Electricity was just too expensive to waste on heating such an unyielding expanse that was the badly designed mall. People got clever and begun to reuse materials to create new, more practical stores. With few cars on the thoroughfares that were once smooth roads, the more industrious and entrepreneurial merchants took over the car parks, ripped up the asphalt, and built structures based on the Earthship model. Pioneered all those years ago by Mike Reynolds, this architectures became the norm for new buildings everywhere. Many thought Mike was crazy as well. The Earthship stores were self-contained, including living quarters for the merchant’s family. Built with old tyres, discarded plastic bottles, and aluminium cans, these materials were incorporated into the fabric of the building. There was very little waste. In fact, many of these items were sourced from all around our town, making the surrounds much cleaner and pleasant. The design is such that the building stays cool in the ever increasing heat of summer, and warm and cosy during our milder winters. A few solar panels keep the electricity on, mainly scrounged from road warning signs along with their batteries. It was repurposing at its best, especially seeing that the roads were nearly unusable anyway. Most buildings had room for a veggie garden inside, kept alive with the grey water from the home. This provided the occupants with a small supply of food in a controlled climate, which is most welcomed. Some shops even have a green roof, which filters the rainwater that collects in large tanks. Like I mentioned, these shops were pretty self-contained. Why these types of building were not the norm back in the days before the great disruption has got me stumped. It seems so logical now, but I suppose logic and common sense were rare commodities back then. “Do you think you can fix it?” I asked. “Dunno, but I will try.” said Barry. Barry was a master of his craft. He used to be a TV repairman back before the crash and he could fix most electronic devices by sourcing parts from trash. He had an abundant source of parts left over from the consumer culture. His skills were in high demand because electronic equipment was prone to breaking due to the use of home built power supplies, and variable voltages produced by the old inverters. Gone were the days where you could pop down the entertainment store and pick up a new flat screen TV. Not that anyone could afford the price nor the electricity from their batteries. Also, people had better things to do with their time, because just about everyone is now a producer. Folks don’t have time to sit and veg in front of the idiot box. Besides, broadcasts are sporadic at best, as it take a heck of a lot of electricity to run a TV station. Once the huge container ships stopped, Aussies soon found that no one manufactured the electronic stuff in this country, so they had to go without if stuff broke. Radios, however, were still well used as were iPods and smaller tablet devices (as long as the batteries were still in good condition). Usually turned on sparingly to conserve the precious batteries and only used for music at special occasions more than anything else. Heck, we weren’t in the Stone Age, were we! Even one shop in the new main street charged and refurbished batteries for those who had limited or no solar or wind power at home. Quite an ingenious service that was born out of necessity. Ben and I left the radio with Barry who said that it should be fixed within a week or two. We headed off hoping to find a replacement mixer and grinder at one of the other shops on the strip. “Where did they come from?” I asked the rugged looking stallholder who had set up a temporary premises between two of the earthship stores. “Got ’em from Tassie mate.” said the stallholder. Lots of growers were kicking themselves back in the early days, having bulldozed thousands of fruit trees just before long distance trade slowed down to a crawl. They quickly replanted, as Tasmania and a few highland areas were the only places left with a winter cold enough to grow this precious fruit. “People are gettin’ clever.” said the stallholder. “Sailing boats are making the crossing at least weekly, trading for wheat and grains. They only last a few months without refrigeration, so get ’em quick.” he said. “Wacha got?” he said gruffly. We walked along the line of shops, looking at all the fruit and nut trees that had been planted. Some genius had managed to run a backhoe long enough to rip up slabs of asphalt so as to expose good soil for planting. The local merchants and their families quickly put in a small food forest, which grew well from all the car park run-off. There were fifteen shops along the strip, ranging from Barry’s Fix-it Store, to a greengrocer, butchers, all the way to the town blacksmith. Well, not really a blacksmith, but the next best thing. John was one of those guys who could make anything out of metal. Once supplies of bottled gas ran out, he had to relearn the old ways of working metal. As we walked into his workshop, John looked up and greeted us with a smile. “No mate. You know I take good care of my tools”, I said. “Just pulling ya leg Gav.” said John. “Sounds like a deal, my old friend.” I said. “Pleasure doing business with you fellas.” John said with a wink. “Likewise mate.” I said as we walked out of the workshop with an almost-brand-new utensil. I knew that we got the better end of the bargain. John was such a kind soul, salt of the earth. Besides, neither Ben nor I knew how to fix the old one, and those apples were cheap. Wheat beer was easy to make and the ingredients were readily available in our area. Whilst waiting, I struck up a conversation with Sarah, the local seamstress. Since cloth started appearing in markets again in bulk due to some enterprising textile factories up north, she was run off her feet. Someone had to make and mend clothes now that the sweatshops of Asia were long gone. “How’s business Sarah?” I said. “Never been better Gav. People just forgot how to make and mend clothes.” she said. “It was a dying trade due to globalisation. I even run workshops to teach people how to repair clothes themselves because I just can’t keep up with demand for my services. This way I can swap services for all my food and the odd silver coin.” she added. “Well done Sarah. We sure would be lost around here without you. Praise where praise is due.” I said. “Come on Dad!” yelled Ben from where our bikes were parked. “See you Gav. See ya Ben.”, said Sarah as she waved us both goodbye. With the hand mixer and grinder, apples, and two sacks of wheat all loaded, we headed off for home. “Have fun, Son?” I asked as I struggled with my turn towing the trailer. “Heck no. You would be lucky to talk to anyone if you went shopping. It was so impersonal that they even replaced the checkout chicks with mindless checkout robots at the end. People just didn’t like it.”, I said. “That must have been a very sad and lonely place to shop.” said Ben. “It was. I like it much better now. Far more personal, even though things are tougher to get hold of. But then again, people don’t need or want half the crap they used to.” I said. “Too true. What did people used to do with all that stuff?” asked Ben. “Not a lot mate.” I said. “Hoarding and collecting trinkets mostly, nothing really useful. My favourite quote of the time was that we buy things we don’t need, with money we don’t have, to impress people we don’t like. That kind of sums it up.”, I added. My guest this episode is Jennifer Richards who blogs at Beyond the Trolley, and has begun producing a podcast called Turn Me Green. We have a great chat about her experiment to avoid supermarkets for a year and what the outcomes of that challenge were. 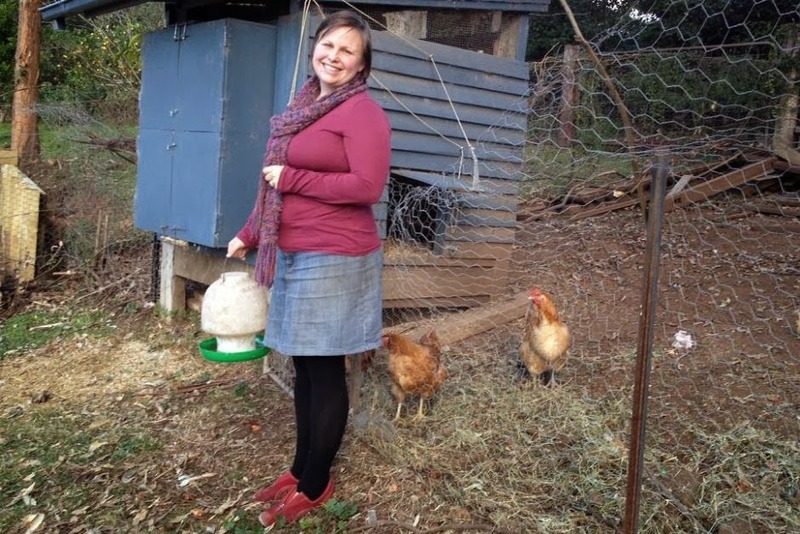 Food security, local food production and backyard chickens are also discussed in depth. 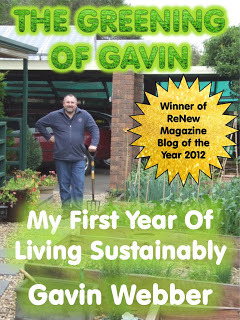 A great interview with a very passionate sustainable living practitioner, which I know you will enjoy. Thanks for sharing you knowledge and experience with us Jennifer. If you are interested here is an ABC radio interview that Jennifer gave a while back. She further explains why she started shopping beyond the trolley! So, now you have listened to the podcast, what do you think about the state of food security where you live? Are we growing more and more dependent on supermarkets that import food or screw over farmers, or are you trying to source food more locally?